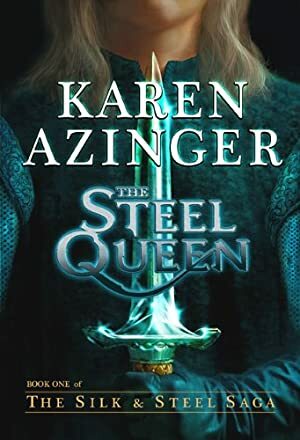 Azinger's series is fast-paced action-packed fantasy. In a medieval world of forgotten magic, mortals are lured to the chessboard of the gods where an epic struggle of lives, loves and crowns hang in the balance, yet few understand the rules. In this game of power, the pawns of light and darkness will make the difference in the battle for the kingdoms of Erdhe: Katherine, 'The Imp': a young princess with the stout heart of a warrior will challenge the minions of a thousand-year-old evil. Liandra: The Spider Queen; who uses her beauty to beguile, her spies to foresee, and her gold to control, will need all of her skill and strength to fight a rebellion with her own blood at it's heart. Steffan, the puppeteer, will corrupt the innocent and unwary with greed and desire, as he sets an entire kingdom ablaze. Log In to track Karen Azinger on eReaderIQ. to be notified each time the price drops on any book by Karen Azinger. to stop tracking Karen Azinger. We started tracking this book on March 19, 2015. This book was $5.14 when we started tracking it. The price of this book has changed 37 times in the past 1,491 days. The current price of this book is $6.62 last checked 3 months ago. The lowest price to date was FREE last reached on November 9, 2018. The highest price to date was $6.62 last reached on January 13, 2019. This book has been $6.62 one time since we started tracking it. We last verified the price of this book about 3 months ago. At that time, the price was $6.62. This price is subject to change. The price displayed on the Amazon.ca website at the time of purchase is the price you will pay for this book. Please confirm the price before making any purchases.